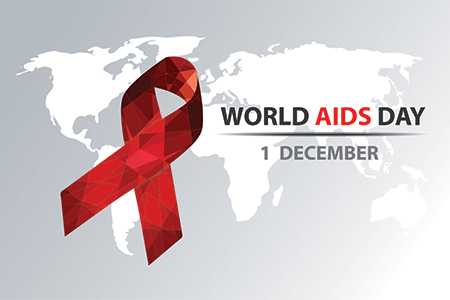 World AIDS Day is an annual event held on December 1st. Started in 1988, the purpose of this day is to raise awareness about HIV and AIDS by sharing information concerning prevention, treatment, and control, as well as to honor and mourn the many lives lost to this deadly disease. The focus of this year's 30th Annual World AIDS Day is to find a cure. When World AIDS Day began the disease was considered a death sentence, but recent research into detection and cures has improved life expectancy. Research such as antiretroviral therapies have transformed treatment for HIV. Other novel research studies are investigating diverse strategies from immunotherapy to genetic engineering to vaccine development. Some research highlights can be found at The 22nd International AIDS Conference. HIV continues to be a major global public health issue, having claimed more than 35 million lives so far. In 2017, 940,000 people died from HIV-related causes globally.